As it takes at least three to five years for medicines developed overseas to be approved in China, many patients desperate for the latest drugs are now buying the ingredients online from illegal dealers and processing them on their own. After exhausting every other medical avenue he could find, Ling Hao (pseudonym) decided to make a last-ditch effort to save the life of his 61-year-old mother. He purchased active pharmaceutical ingredients (APIs) to make his own medicine. His mother tried all the relevant medicines sold on the Chinese market but her cancer still spread from her lungs to her brain. So Ling decided to give his mother what he calls the last "trump card" - 9291, the code for a cancer drug that hasn't been introduced to the Chinese market, a drug that are still being researched domestically. The codes 2992, 4002 and 9291 are the three mentioned most frequently in cancer patient support groups in the past years. AZD9291 refers to the third generation of the anticancer medicine Osimertinib. Because of its effectiveness during clinical trials, it has been approved by the US Food and Drug Administration (FDA). However, the medicine is still going through China's slow clinical trial phase and hasn't yet been legally approved for sale. It usually takes three to five years or even longer to import medicines developed overseas to China as Chinese law says that all medicines need to be first tested by domestic watchdogs. But cancer patients who have only a few months left to live can't wait. In the past, many patients got friends or middlemen to buy them medicines when traveling overseas. But after Lu Yong, a businessman and chronic myelocytic leukemia patient, was charged in 2014 for selling drugs he purchased in India, some people are now turning to a more risky way to getting these drugs - buying the chemicals online from lawbreaking dealers and trying to make the medicines on their own. "Now many patients are becoming doctors and chemists. About one third of the patients I've met bought APIs to make medicines on their own," said Wu Yilong, the deputy director of Guangdong General Hospital. But this could be deadly for patients. He recalled that when API 9291 first appeared, a patient of his died suddenly after using a DIY version of the drug. When APIs are used by pharmaceutical companies, they go through strict processing standards to ensure the consistent quality of the resulting medicine. But DIY druggists have neither the time nor capability for such precision. Articles circulate among cancer patient groups instructing patients on how to make medicines which list the necessary equipment, the required method and how to deal with side effects. All the equipment needed to weigh, proportion and otherwise crudely process APIs can be purchased on taobao.com, China's leading e-commerce website. But it's hard to find the API for 9291. Ling eventually got it from K, a lung cancer patient. K survived his bout with cancer by using 9291 and now he makes a living by selling the API needed to make it. Ling bought three grams of the API from K - enough for a month of treatment - for 600 yuan ($90) per gram. "It is even more expensive than gold," he said. 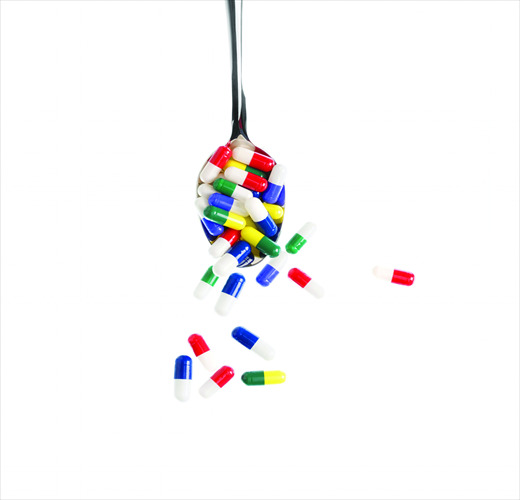 To avoid unnecessary wastage, patients have learned that it's necessary to use tin foil or oil paper to weigh the powder and fill the capsules. "If you use normal paper, the powder will get stuck to it," Ling explained. Mixing the potentially life-saving (and potentially life-ending) powder tests people's nerve and dexterity. Before moving the powders, Ling puts on a pair of clinical gloves to avoid his sweat making the powder stick to him. A mask is a must, because the skin around his mouth and nose could have a reaction to the powder if he breathes any in. Ling follows the procedure step by step. He doesn't dare make any mistake. Every one gram of API is mixed with four grams of auxiliary materials and shaken well. "Only when you mix them fully, will the side effect be minimized," he said, adding that it's best to sift them more than 20 times. When your hands get sore, then you know you can put the powder into the capsule, he said. He then fills 30 capsules with each 5 grams the mixture, enough for a month's course of treatment. 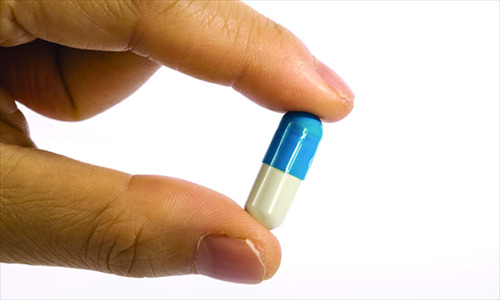 A novice can take up to five hours to filled just a few capsules. So some vendors have started to offer a capsule-filling service to make extra money. Groups on Chinese social media platforms QQ and WeChat are the two main channels for patients and drug dealers to trade APIs. Most founders of these groups sell these drugs. If you want to buy APIs, you need to provide your clinical records to the founder and submit to their inspection to enter the group. To guarantee safety, those who haven't provided clinical records and their diagnosis certificate will be kicked out within 24 hours. "The APIs are labeled as fake medicines in China. Selling them violates the law. And buying an API to make medicines on our own is also risky," one patient told the Southern Weekly. The channels for getting the APIs are complex and it's hard for people to tell whether they are genuine. According to patients and dealers, most APIs come from scientific institutes, laboratories and drug companies. The price of an API varies according to its purity. An API of "average" purity costs about 500 yuan per gram and if the purity reaches more than 99.7 percent, the API can be sold for 1,000 t0 1,500 yuan per gram. "The side effects of highly pure APIs are much less than low-purity ones. Low-purity medicines have more heavy metals and other impurities, which can damage the patients' liver and kidney. Thighs also get puffy easily due to eating low-purity medicines," said one dealer. In his online shop, high-purity APIs are priced at 900 yuan per gram. Another dealer guarantees that the purity of the APIs he sells for 1,500 yuan per gram is 99.98 percent. "We synthesized the APIs in a Beijing scientific institute. They're first-hand," she said, but declined to reveal the name of the institute. Some others are quite open about the home-made nature of their chemicals. One vendor explained that a whole kit to synthesize APIs can be bought for 800,000 yuan. One seller contacted by the Southern Weekly claimed that his medicines take effect within a month and can help extend a patient's life span by at least 10 months. "Couriers have been checked very strictly these days. You should take the chance to buy the APIs if you want them. I still have several grams in stock," the seller urged. Li Yinghuan, a teacher of Capital Medical University, told the Southern Weekly that most new medicines are invented abroad and then imported to China. Some 95 percent of Chinese drug companies make copycat medicines. Once a new drug enters the market in the US, for example, its molecular structure is made public. Then drug companies and laboratories in China make similar new medicines. As the molecular structure is clear, it's easy to copy. According to Chinese law, it's legal for medical institutions to synthesize these APIs, but they are only allowed to use these compounds for research. Selling them for human consumption before they are officially approved is banned. Li said that it's understandable that terminal patients synthesize APIs to make medicines on their own. "They (patients) don't care whether it's safe or not. 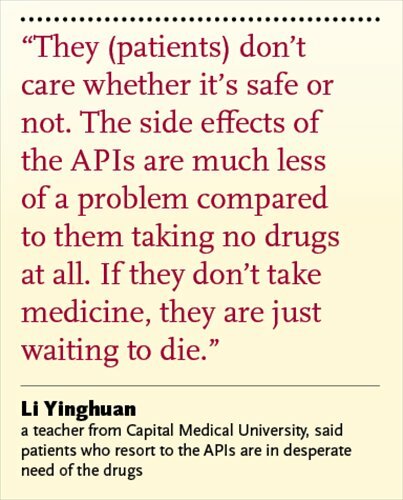 The side effects of the APIs are much less of a problem compared to them taking no drugs at all. If they don't take medicine, they are just waiting to die," she said. However, homemade medicines do carry a significant risk. "In a medical sense, the purity, proportioning and quality safety are all uncontrollable. In a clinical sense, a low dose could lead to drug resistance and a high dose could be deadly," said a scientist from the China Food and Drug Administration. A doctor at Shanghai Huashan Hospital said that he is unsure whether doctors should help self-medicating patients or not. "They've brought medical chaos. When patients who are taking medicines that haven't got approval in the country come to me, as a doctor, should I supervise them or not?" he said. In an emotional sense, he should help them. But the medicines' effects are unknown so doctors cannot give these patients reliable advice. According to Chinese law, it is illegal to sell both unapproved medicines purchased overseas or such APIs synthesized in China. The law stipulates that medicines that haven't been officially approved for production and imported are deemed as fake medicines. Producing and selling fake medicines to pregnant women, babies, children and severely-ill patients are grave crimes in criminal law. Recently, two people working for a Nanjing, Jiangsu Province drug company were sentenced to 10 months in jail and fined for synthesizing and selling unapproved drugs. But all patients care about is finding the most effective medicines. Now some patients are looking to PDI, a new drug available in the West which can apparently treat cancer by using the body's own immune system. "PDI is too expensive. A single injection costs about 30,000 to 40,000 yuan and 600,000 yuan a year. This is too much for my family," Ling said.